Put the cannellini beans into a large pan, pour in water to cover and bring to the boil. Reduce the heat and simmer for 40 minutes. Meanwhile, heat the Toscano Extra Virgin Olive Oil in another large pan. Add the onion, celery, carrots, potatoes and courgettes and cook over a very low heat, stirring occasionally, for 30 minutes - this will be your base and is known as 'soffritto in Italian.' Season with salt; add the Swiss chard and cabbage and cook, stirring for a few minutes. Cover the pan. Drain the beans, reserving the cooking liquid. Press half the beans through a sieve into a bowl (or use a blender), then stir the puree into the pan of vegetables. Add the reserved cooking liquid and simmer for 1 hour. Add the remaining whole beans and parsley and simmer for another 1 hour. Remove the soup from the heat and season with salt and pepper to taste. Add the freshly grated nutmeg (optional). Serve hot over sliced rustic-style bread and drizzle generously with Filippo Berio Toscano Extra Virgin Olive Oil. The perfect pairing for this hearty, winter soup would be a young, fresh, medium-bodied red, perhaps a Tuscan Sangiovese IGT. 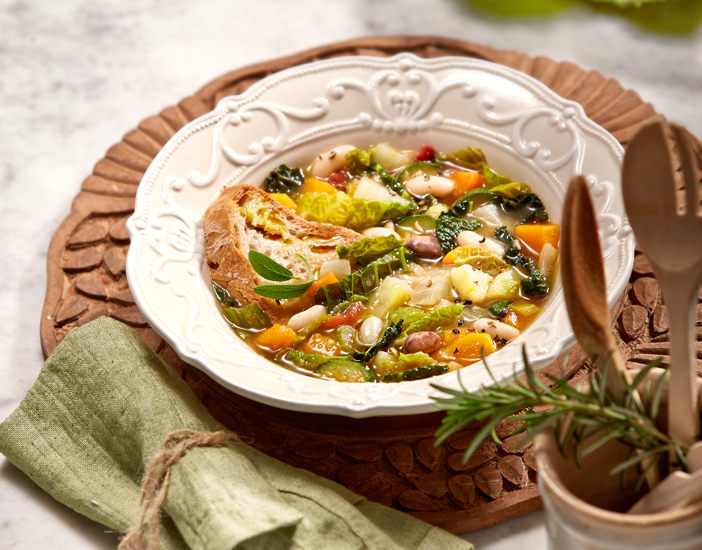 As the name implies, the key to this Tuscan vegetable based soup is the Olive Oil. Traditionally made to highlight the newly pressed Tuscan Extra Virgin Olive Oil, this soup is one of the most popular dishes in traditional Tuscan cuisine. The term 'Ribollita' literally means 'boiled again', and refers to the fact that the vegetables used to make this soup were usually leftovers from previous dishes, cooked again with bread and of course, olive oil. This hearty soup can be frozen for up to 2 months or stored in an airtight container, in the fridge for 2-3 days.